Frank has extensive experience up and down the U.S. coastal waterways, B.V.I and Bahamas areas. 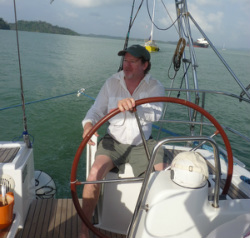 Frank is an experienced navigator and quite a handy-man and can prepare a vessel for most voyages. Frank is a U.S.C.G. 100 Gr. Ton Master with Sail and Tow endorsements. "We are very conscientious and careful with other’s property, especially a valuable asset – their boat! We treat it as if any threat is a threat against ourselves. We pride ourselves in prompt, trustworthy care – a clean, safe and well informed delivery process."